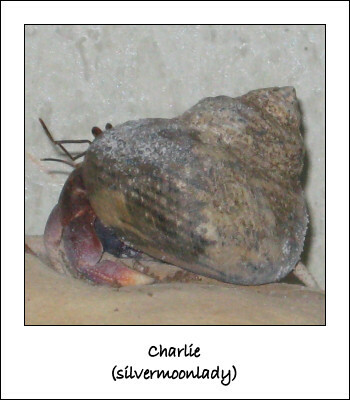 Charlie Hermit crabs are not the typical pet. They aren’t really all that cuddly, and most people don’t consider them cute (I beg to differ). Nonetheless, they were my first pets, and I loved them dearly. My first hermit crab was George. I bought him as my birthday gift to myself. I’d always wanted a pet, but I needed one that could live in a cage and that wasn’t also a rodent or reptile. George was a cute little guy, and I used to let him run around the living room floor. His favorite place to crawl was under the rocking chair, and we always watched him carefully in that dangerous place. I soon realized that George needed some shelled friends of his own, so I brought home Bubba and Pearl. Bubba was like a bulldozer – clambering over any obstacle. His attitude reminded me of a truck driver, hence his name. Bubba was truly fearless, and he was the only one whom I ever saw change his shell. In fact, he changed his shell nearly as often as we change our clothes. He was also the largest of my little critters, and barely fit in the palm of my hand. Pearl, on the other hand, is shy. The sand in their tank was deep enough for them to tunnel, and she did! I wouldn’t see her for days, but sometimes her tunnels were right along the glass, and I could see her digging around underneath the sand. Sadly, soon after the addition of his new friends, George passed away. He became lethargic and refused to come out of his shell, and eventually slipped away. My first pet, while not particularly cuddly, had really brightened my days, and even my students’ days. On quiz days, I would bring in one of my little pets and let him or her roam around in a gerbil ball. My students loved it; animals are always intriguing and will constantly surprise their humans with new little quirks every day. Because hermit crabs like to live in groups of three, and I didn’t want Pearl and Bubba fighting, I brought home Charlie soon after George’s passing. She wasn’t a replacement, but I wanted to keep my other two treasured pets healthy and happy, and that is their natural living situation. Charlie was a funny little critter because while she was as small as Pearl, she had no problem showing Bubba who was boss! Charlie was also the most adventurous of my little guys – I would often spot her crawling upside-down on the mesh cover, and she would climb just about anything I put in their terrarium. Unfortunately, I had to give my pets away when I moved, and they went to a family whose son had disabilities. He was happy to have his own pet to look after, and these little critters would teach him responsibility and compassion. It is in situations like this that we see how pets have as much to give to us as we give to them, often more. It was after this that I received the call that Charlie, and later, Bubba, had both passed away. These unassuming little critters touched many lives – my students’, the young boy’s, and my family’s – and I will remember their antics and little personalities always.